My daughter’s friend paid us a visit from Dubai, the fastest growing city in the world with the world’s largest shopping mall, comprising over 1,200 stores. I always get so fascinated when I hear someone is from Dubai because it has the tallest building, tallest hotel and world’s largest aquarium amongst many other attractions. Anyway, she brought us Emirates Dates. They didn’t look pretty but they were soft and sweet. Very sweet! 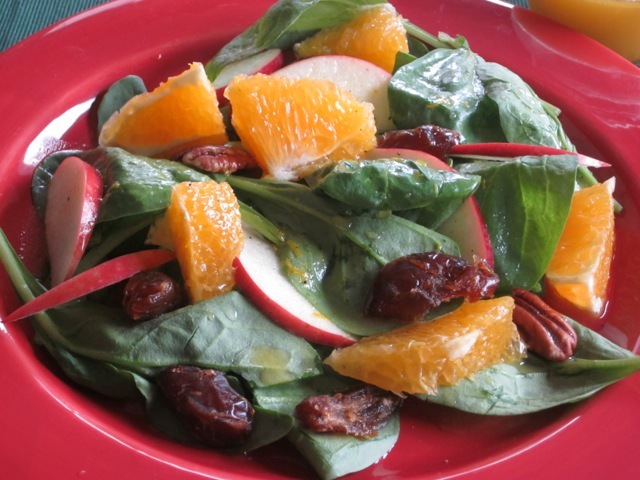 I baked several cakes with them and the reminder went into this salad that also has some honey in the dressing. 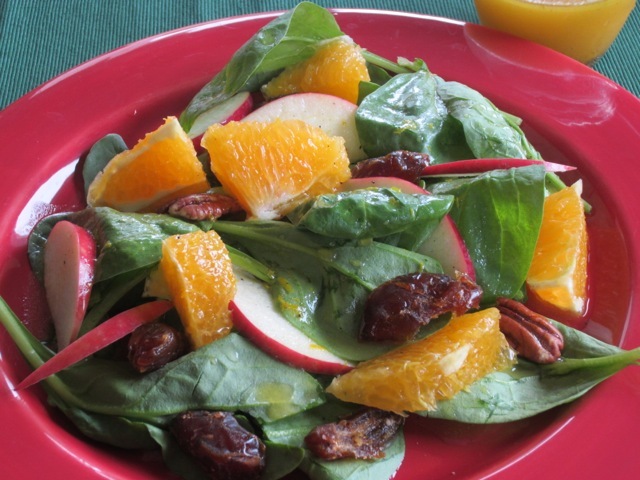 The sweet dates, coupled with the orange-honey dressing, orange segments and some crunchy apples and pecans form the basis for this salad. If you want to know what it tasted like, please make some for yourself. I totally loved this salad, so the last of my dear Emirates dates got finished so quickly, I was left wondering. I hope you are enjoying your weekend. I spent a better part of the day watching world cup. What about you? I wish you a wonderful Sunday. or pour into an airtight jar and shake thoroughly. Check seasoning. 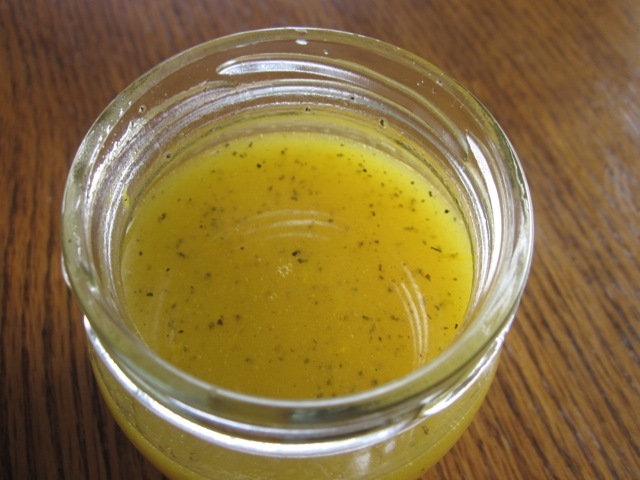 Drizzle orange dressing over salad. 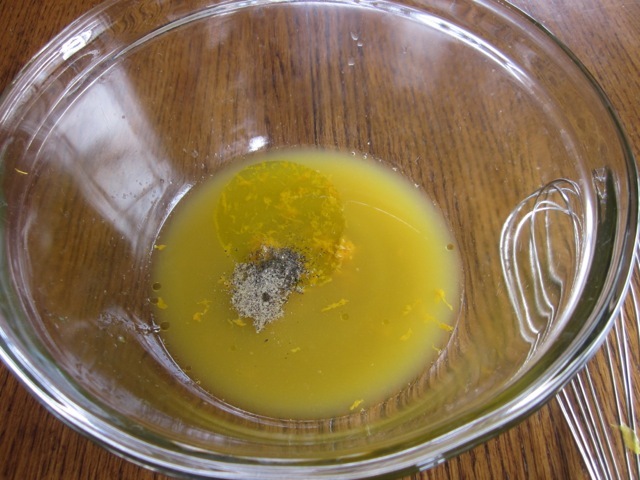 To make orange dressing: combine all the dressing ingredients in a bowl and whisk vigorously or pour into an airtight jar and shake thoroughly. Check seasoning. Oh you are fasting and having elections at the same time? Isn’t that tough for those who are fasting. I love dates. They are so sweet and great for snacking! The election day was a national holiday, so that everybody can participate without worrying about their jobs, etc. Fasting month in Indonesia is pretty “adaptable”. We only have two seasons. It means the length of the day is pretty much the same all year long. (I heard the Swedish Muslims have to fast for more than twenty hours this year. They are having long summer days). Oh God I don’t envy those swedish muslims. I’m glad to hear it was a designated holiday. I wish you all the best with the results. I just saw on news yesterday. Have a great weekend, ahead! 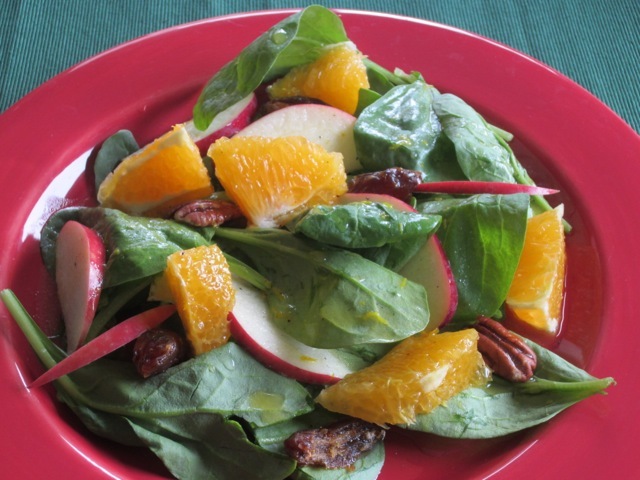 What a great post – this salad looks so tasty! Thank you, Nancy. Best wishes! What a healthy salad Liz with all the ingredients supportive of each other , nutrition wise . Beautiful. Thank you, Sonal. I wish you a lovely week! A perfect summer salad. And love the red plates – lovely contrast. Thank you. Enjoy the new week! What a yummy looking salad! 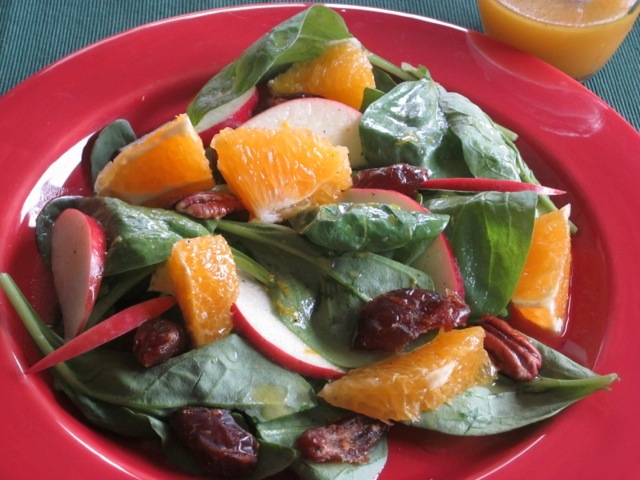 Citrus goes so well in salads and the dates look great. Enjoy the rest of the World Cup! Thank you. The next match is on Tuesday. Have a lovely Sunday! Sounds like a very nice combination of flavors and textures! And it sounds easy to put together, so you could keep your focus where it belonged–on World Cup! Ha ha it’s a great combination of flavours. 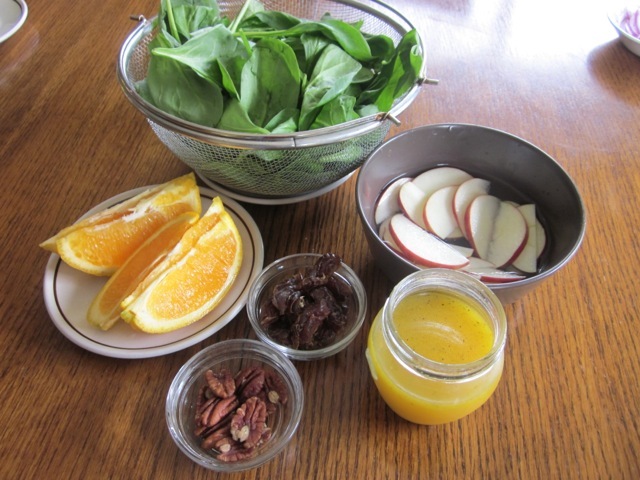 Nice way to eat baby spinach. Enjoy Sunday! I hope you are doing the same right now. What a healthy way of snacking that was! I would have enjoyed every moment in your house If I were your sibling. happy trying and have a great Sunday! But very tasty too! Enjoy Sunday! A nice accompaniment for an otherwise plain meal. 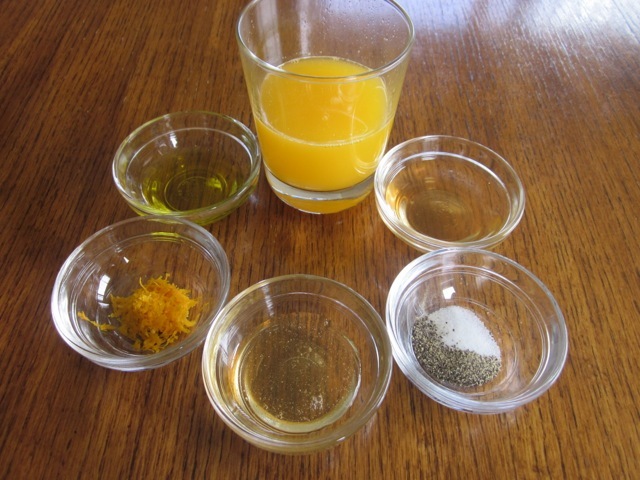 I always have these ingredients around, except for the oranges, so will need to think of an appropriate venue. I have loads of oranges and tangerines in my fruit basket right now. Will be having the same salad for lunch tomorrow. Have a good night! Looks like a nice fresh salad, maybe paired up with some cold sliced ham or a piece of chicken, or even all by itself! Dates really are versatile aren’t they? How nice that you were the recipient of dates from the Mid East! Grown in all natural sunshine, I can almost taste them myself. Hope your weekend is going well. Happy Sunday! Thank you Sandy. The dates were so sweet, I’ve never tasted any so sweet. My weekend is full of World Cup. The next match is on Tuesday. The weather is good. I am sitting by the window with a cool breeze floating in. Have a lovely Sunday too!